What happens when an astrophysical jet moving at enormous speeds plows into the gas and dust around it? Some of that matter gets dragged along for the ride — and according to this author, this process could create the two different types of jets that we see. In this paper, the author summarizes his recent work on the subject of how jets behave as they travel through the medium around them. The jets emitted from Active Galactic Nuclei (AGN) can be categorized in two ways based on their appearance: as a Fanaroff-Riley I (FR I) or a Fanaroff-Riley II (FR II) jet. Figure 1 shows an FR I jet on the left and an FR II jet on the right. As you can see from the figure, FR I jets are generally lower-luminosity, aren’t very collimated, don’t have distinct endpoints, and seem to be moving slower than the local speed of sound (subsonically). In contrast, FR II jets are higher-luminosity, stay tightly collimated as they travel through space, have very distinct endpoints, and seem to move supersonically. In Figure 1, the fact that we can only see the right-hand half of the FR II jet in 3C 175 is thought to be a relativistic effect that indicates the jets are moving close to the speed of light. So what causes FR I jets to be moving so slowly compared to FR II jets? Is it something intrinsic to the jets themselves, or does it have to do with their environment? And what impact do the jets’ interactions with their environments have on the radiation that we see from them? The author of this paper sets out to tackle these questions. The author suggests that the difference we observe has to do with the environments around the jets — his hypothesis is that the lower-luminosity FR I jets have been decelerated as a result of plowing through the cold, slow gas and dust around them. Two words come up when we talk about this sort of thing: “entrainment” and “mass-loading”. Entrainment refers to the jets picking up the material they move through and dragging that material along with it. Mass-loading refers to the fact that these jets are initially thought to consist mostly of radiation, but become heavier and heavier as matter gets entrained or “loaded” into them. This eventually slows the jets down and might explain why FR I jets are moving subsonically. 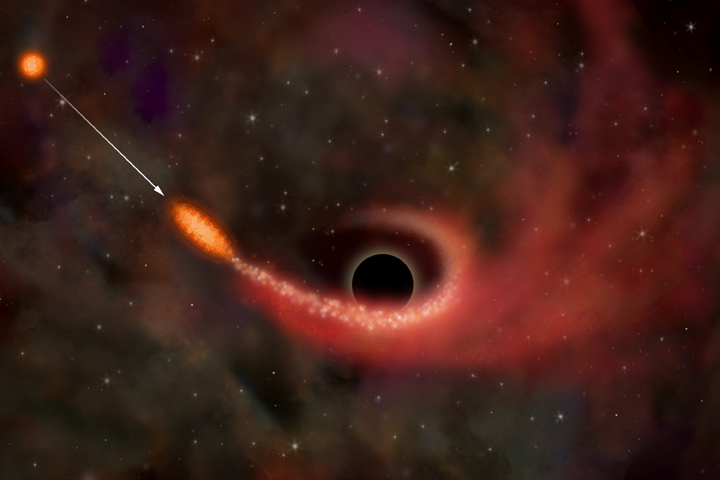 The author conducts a series of numerical simulations modeling FR I jets as they propagate the first few kiloparsecs outward from the central black hole. In particular, he looks at two ways in which these jets could become mass-loaded: stellar winds could pollute the jet, or the jet could interact with gas clouds that might be orbiting the galactic center. Figure 2: Simulation of a gas cloud getting disrupted and entrained into the stream of a jet. The top panel shows pressure; the bottom panel shows density. 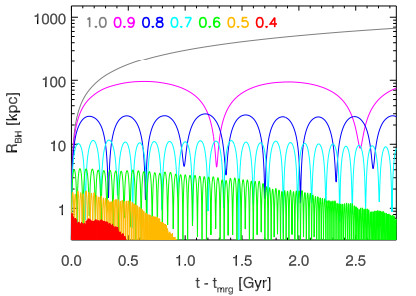 Mass-loading from stellar winds looks like a pretty feasible possibility, under the right conditions. Winds typical of the stellar populations expected in these galaxies would only be able to decelerate jets that have luminosities up to 1042 erg/s; jets with luminosities in the range of 1044 erg/s or more would be too powerful to be slowed by these winds. This type of mass-loading would therefore work to slow down low-power FR I jets, but other methods are needed to slow down higher-power FR Is and FR IIs. A look at the effects of the jet running into a cloud of gas comes next (see Figure 2). The author demonstrates that a shock wave slams through the cloud when it interacts with the jet, eventually disintegrating the cloud and leaving the resulting gas to be entrained by the jet and carried away. This shock wave could convert a lot of the jet’s kinetic energy into radiation, and the author argues that this type of jet/cloud interaction could therefore account for the high-energy radiation that we often observe from AGN jets. 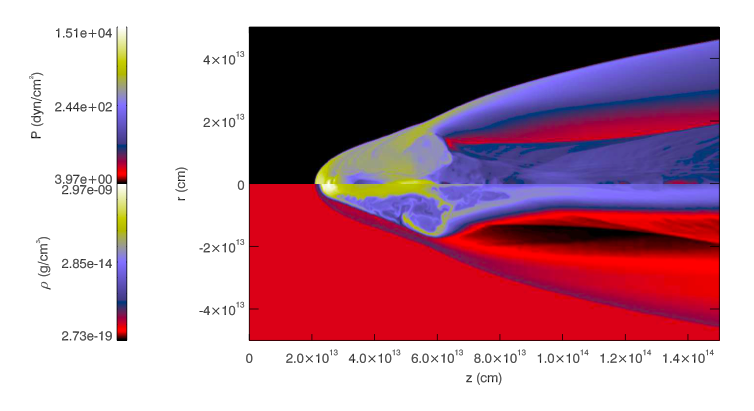 The simulations that the author summarizes here demonstrate that both of these ways of mass-loading jets could ultimately contribute to jet deceleration and could help explain the jet morphologies and the radiation that we see. This brings us one step closer to understanding some of the mysteries of AGN and their powerful jets.